"Take now...some hard-headed business man, who has no theories, but knows how to make money. Say to him: "Here is a little village; in ten years it will be a great city—in ten years the railroad will have taken the place of the stage coach, the electric light of the candle; it will abound with all the machinery and improvements that so enormously multiply the effective power of labor. Will in ten years, interest be any higher?" He will tell you, "No!" "Will the wages of the common labor be any higher...?" He will tell you, "No the wages of common labor will not be any higher..." "What, then, will be higher?" "Rent, the value of land. Go, get yourself a piece of ground, and hold possession." And if, under such circumstances, you take his advice, you need do nothing more. You may sit down and smoke your pipe; you may lie around like the lazzaroni of Naples or the leperos of Mexico; you may go up in a balloon or down a hole in the ground; and without doing one stroke of work, without adding one iota of wealth to the community, in ten years you will be rich! In the new city you may have a luxurious mansion, but among its public buildings will be an almshouse." 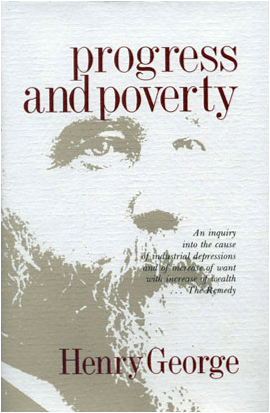 In Progress and Poverty, George explores why poverty always accompanies economic technological progress. "Free trade means free production. Now fully to free production it is necessary not only to remove all taxes on production, but also to remove all other restrictions on production. True free trade, in short, requires that the active factor of production, Labor, shall have free access to the passive factor of production, Land. To secure this all monopoly of land must be broken up, and the equal right of all to the use of the natural elements must be secured by the treatment of the land as the common property in usufruct of the whole people." In Protection or Free Trade, George examines the debate between protectionism and free trade.